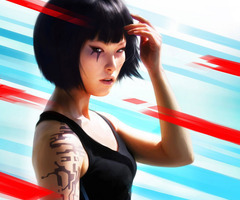 Faith Background Tile. . Wallpaper and background images in the Mirror's Edge club tagged: faith outside runner background. This Mirror's Edge photo might contain leotardo, maillot, juego del cuerpo, traje de gato, leotard, unitard, traje de cuerpo, mameluco, and juego del gato.